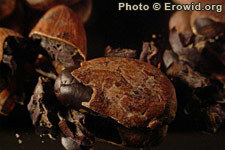 Theobroma cacao is a medium sized tree which produces large bean filled fruit. These cacao beans are fermented and processed to create chocolate. They contain the stimulants caffeine and theobromine and have a long history of human use in S. America.